Summer is now officially on it's way here in Michigan. The days are getting longer, sunnier and much warmer. My kids already have a fresh batch of skinned knees. Ah yes...Summer. 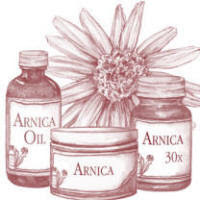 Something I think every household should stock up on for summer is a wonderful little homeopathic called Arnica. Summer is usually full of scrapes, bruises, sore muscles, overexertion and other various injuries. Arnica is a great natural remedy for all of the above. Some might be unfamiliar with the use of homeopathics. The basic principles of homeopathy are that the natural state of the human body is one of health and that we possess the natural ability to heal ourselves. What we describe as symptoms are actually the body's efforts to protect itself against disease. Therefore, to effect a cure, we should not suppress the symptoms, but seek to stimulate the body's own natural healing processes. 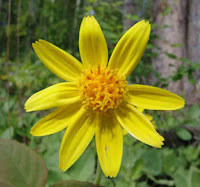 Arnica is made from an herb called Leopard’s Bane that grows in the mountains. German peasants observed that if a sheep or goat fell down on a hillside and hurt itself, it would nibble the leaves of this plant. Arnica is priceless to keep around the house for the aftereffects of a fall, overexertion, injury from a blunt object, shock from an injury, soreness, healing of bruised tissue, and to control bleeding. To sum it up the person who needs Arnica is the one who feels bruised and sore. One should take Arnica every three to four hours. Place the tablet or pellet (depending on the type you purchase) on or under the tongue and allow to dissolve in the mouth. Discontinue as soon as improvement is noted. If pain is especially intense take Arnica every fifteen minutes until pain subsides. Children can safely take half of the adult dose recommended on the packaging. As an added aid, apply Arnica externally to the bruised area. A topical lotion or cream will help speed healing and relief. A word of caution, do not apply Arnica directly to broken skin as it will irritate open tissues. Arnica also works great for those who are undergoing surgery. Take two tablets of Arnica before and afer surgery then repeat as often as needed. This will help reduce pain and minimize the need for narcotic medications. Now off to enjoy the beautiful day! Labels: Children's Remedies, Homeopathy, What's in Your Medicine Cabinet?? My mother-in-law introduced me to Arnica and now I'm a believer! It really works and I make sure that we have both the tablets and the gel in our home.